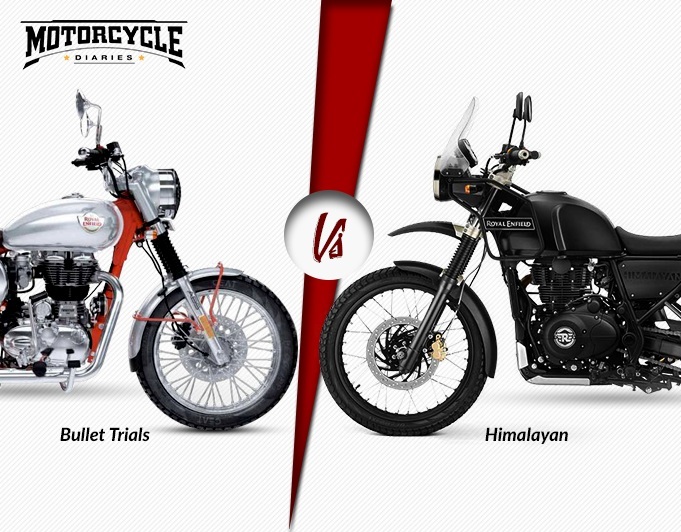 Hey there, guys, this Royal Enfield Himalayan vs Bullet Trials 350 is not entirely a comparison post. Instead, I will talk about which kind of rider must opt for certain motorcycle and why. 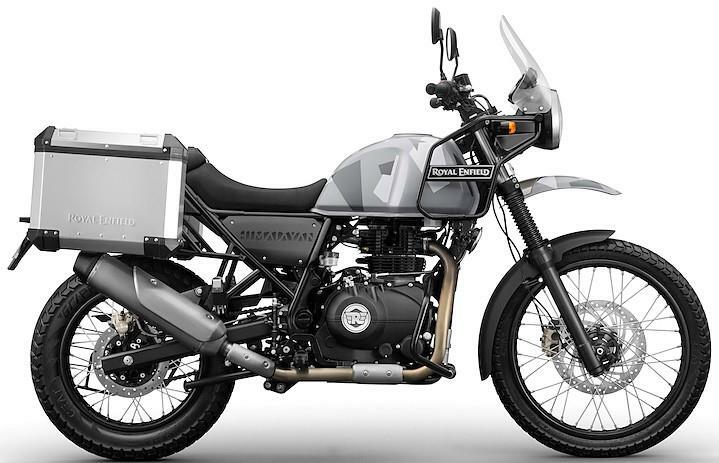 So here we have a capable off-road centric as well as adventure tourer Royal Enfield Himalayan 400. On the other side, we have recently launched retro styled Bullet Trails 350 which is designed for short offroad trials. 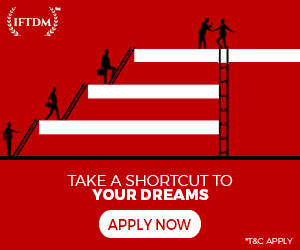 Let’s start with what is visible to the naked eye. 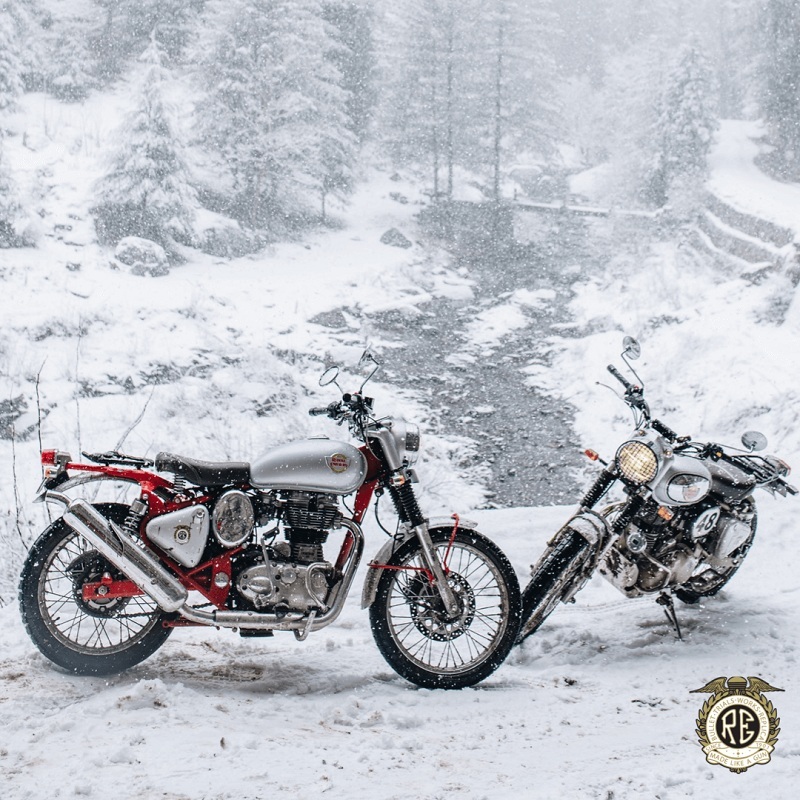 The two bikes are a way different in looks as Himalayan is a proper Adventure Tourer whereas Bullet Trials is a classic motorcycle which few add-ons to take on trials. Just by the look of it, the Himalayan 400 has a higher stance. The bike gets beak type front mudguard which will prevent gravel and mud from splashing everywhere. Headlight, on the other hand, is placed higher and is not turnable. A large windshield is there to keep you safe from high-speed wind blasts. The fuel tank is narrow which is helpful for riding in the standing position. Seats are comfortable for both Rider as well as pillion. 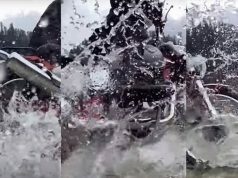 Himalayan is a solidly built motorcycle and doesn’t break anything on light falls. Handlebars are high raised which provides a comfortable riding posture for both sitting and standing position. Himalayan is available in three color options, viz. White, Black, and Sleet. Moving on to the newly launched Bullet Trials, the 350cc motorcycle is based on Classic 350 motorcycle. The new logo is lifted from interceptor 650. Rear seat has paved the way for a luggage rack which is useful for long rides. 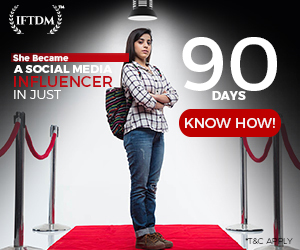 But you cannot take a pillion with you and that’s a minus point. The exhaust pipe will not scrap on the rough terrain as it is an upswept unit. 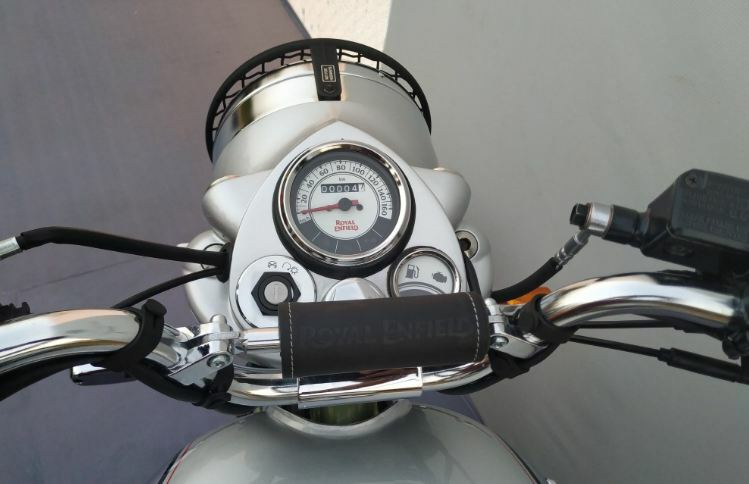 At the front end, the headlight and handlebar assembly are taken from the regular Classic 350 model. However, the tail light is borrowed from the interceptor 650 which looks cool. There is only one color option available, ie, silver with red color frame. 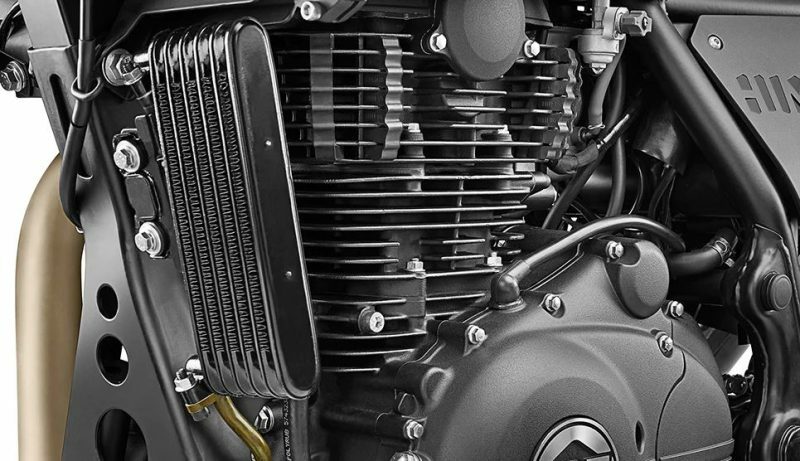 There is a 410cc engine powering the Himalayan. The powerplant is good for 24.5 bhp and 32 nm torque. A 5-speed gearbox transmits power to the rear tyre. Speaking about the performance, Himalayan does a 0 to 100 kmph in 12 seconds which is not bad for the bike of this size. See, when you are touring, you’ll mostly ride at 90-100 kmph and Himalayan has a sweet spot at this speed. But sometimes, only for fun’s sake, you explode to the top speed of a bike and this one will take you to a top whack of 130 kmph which is respectable figure considering the 190 kg weight and large proportions of Himalayan. 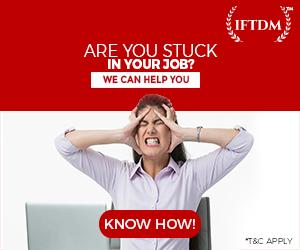 Bullet Trials disappoints in this department. 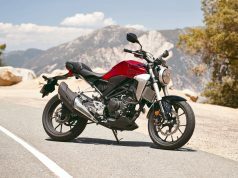 Powering it is a 346cc air-cooled engine which develops 19.8 bhp and 28 Nm torque. This motor is also mated to a 5-speed gearbox. Bullet Trials 350 weighs 187 kg (wet) which is on a higher side when we look at the power figure. Speaking of its performance, the might do a 0 to 100 kmph run in 17-18 seconds. 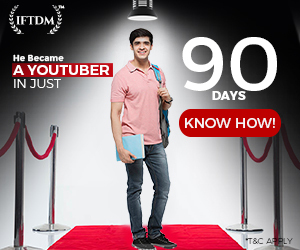 Top speed is also on a lower side as 110 kmph is hard to achieve. Since the bike is equipped with dual purpose tyres, it will perform well on the rough terrain. Now let’s talk about which bike has what to offer. 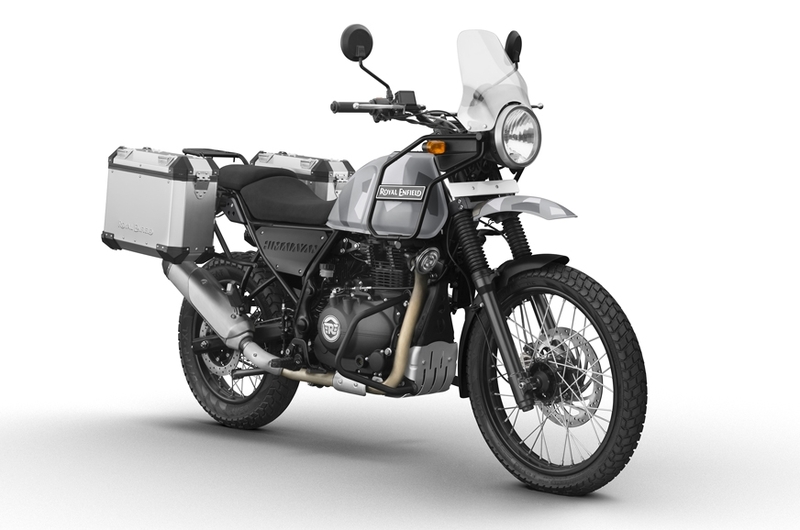 Himalayan 400 is an Adventure Tourer motorcycle on a budget but it doesn’t mean that it is a bare basic motorcycle. Himalayan has everything which makes it a capable adventure bike. There is a hazard light switch which warns others if rider stops by the roadside. Feature packed instrument cluster has nearly every possible information you’ll ever need. Ahem Ahem! 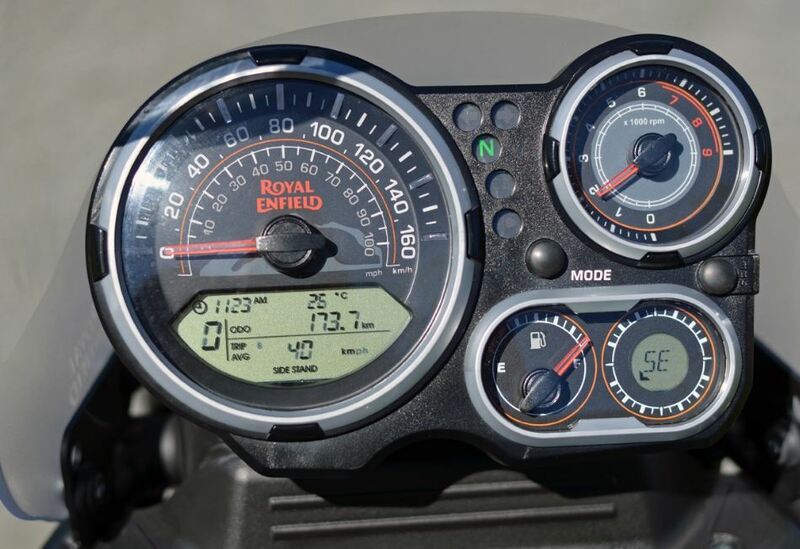 speedometer, odometer, gear position indicator, twin trip meters, tachometer, fuel gauge, service interval, a digital compass, a clock as well as an ambiance temperature indicator. I would have loved distance-to-empty indicator as a must have for adventure tourer. A pair of telescopic forks are present at front with 200 mm travel, that’s quite a travel. The rear suspension is a monoshock with 180 mm travel which provides a comfortable experience. To stop this behemoth we have 300 mm disc with 2-piston caliper at the front which provides adequate stopping power. And at the rear end is a 240 mm disc with single-piston caliper. A dual-channel ABS makes the bike safer to run at any kind of surface. 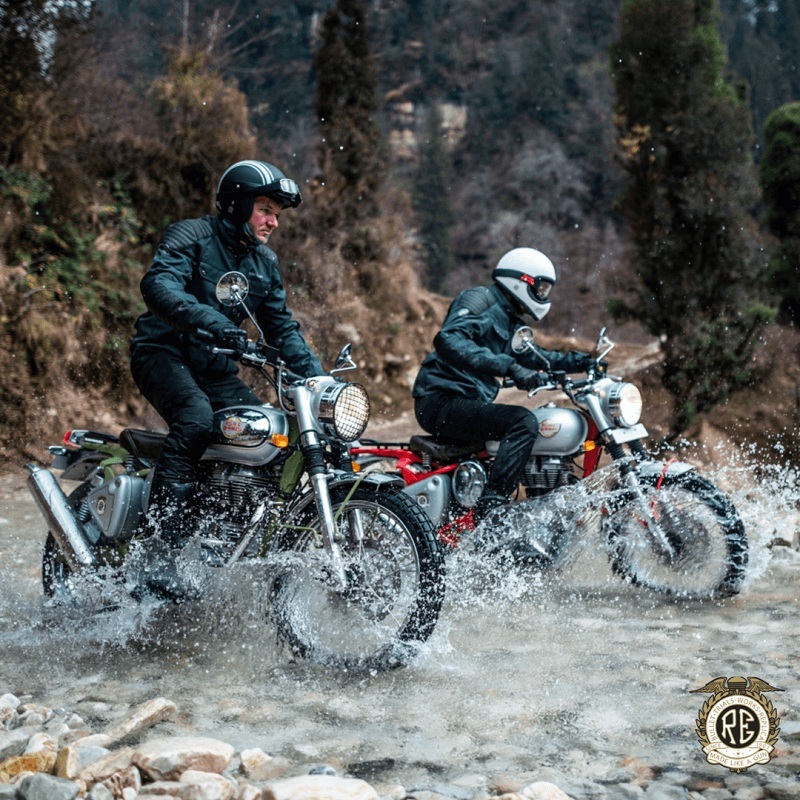 The Adventure bike rides on 90/90-21 and 120/90-17 tyres and it becomes easy to tackle even worst terrains. Dual purpose tyres from Ceat are impressive to ride, they offer ample grip on or off the road. There are various accessories like mounting, saddlebags, and Panniers, etc available at the dealership level across the country. Himalayan has an accessible seat height of 800 mm and even a short rider of about 5 feet 5 inches can touch their feet on the ground. Even with a seat height this low, the ground clearance is pretty high at 220 mm. This one wins my heart. 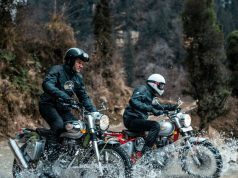 Royal Enfield Himalayan is indeed a go-anywhere motorcycle. Seriously. Okay, Bullet Trials doesn’t have much to offer in terms of features and exclusive components. There are dual-purpose tyres from Ceat to deal with the trials in unknown places. Ground Clearance is very low at 135 mm which could have gone up to at least 170 mm. The instrument cluster is basic with just a speedometer, odometer, low fuel indicator, and ABS warning lamp. Telescopic forks and rear twin shock absorbers do take on suspension duties. We have a 280 mm disc with 2-piston caliper at the front which provides adequate stopping power. And at the rear end is a 240 mm disc with single-piston caliper. A dual-channel ABS makes braking safer. Now, you have read everything these bikes have to offer. Let me tell you the price of these bikes before discussing which one to buy. 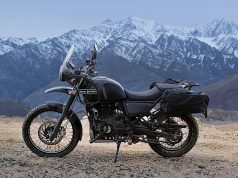 The Himalayan is priced at Rs 1.82 lakh and Bullet Trials 350 carries a price tag of Rs 1.62 lakh. Both prices are ex-showroom. First, let’s get done with Bullet Trials 350. 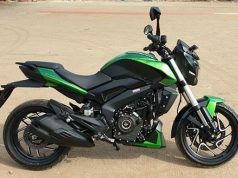 This is genuinely for those who want to an additional motorcycle just for pure fun. At 135 mm ground clearance, Trials will not have good day off-roading. No pillion seat means you cannot use it on a daily basis unless you live alone and doesn’t have sticky friends. Himalayan, on the other hand, is my pick here. 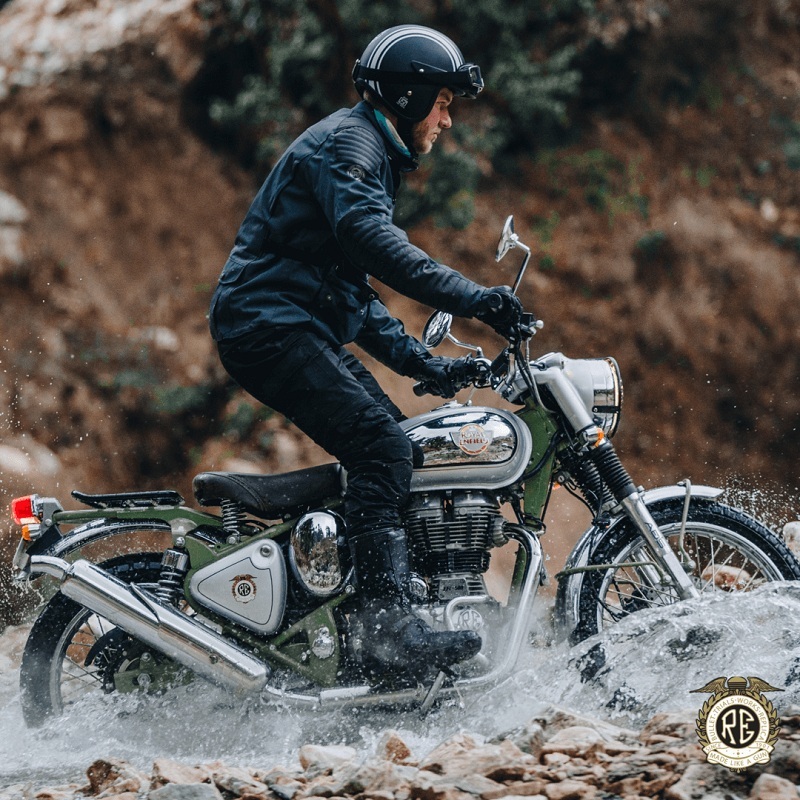 The adventure bike offers good performance, it has better components, more features, and not to forget it gives you pleasurable ride experience over long distance touring or off-roading. A ground clearance of 220 mm is high enough to tackle most of the terrain. A fuel tank capacity of 15 liters means you’ll have lesser visits to the fuel bunks. 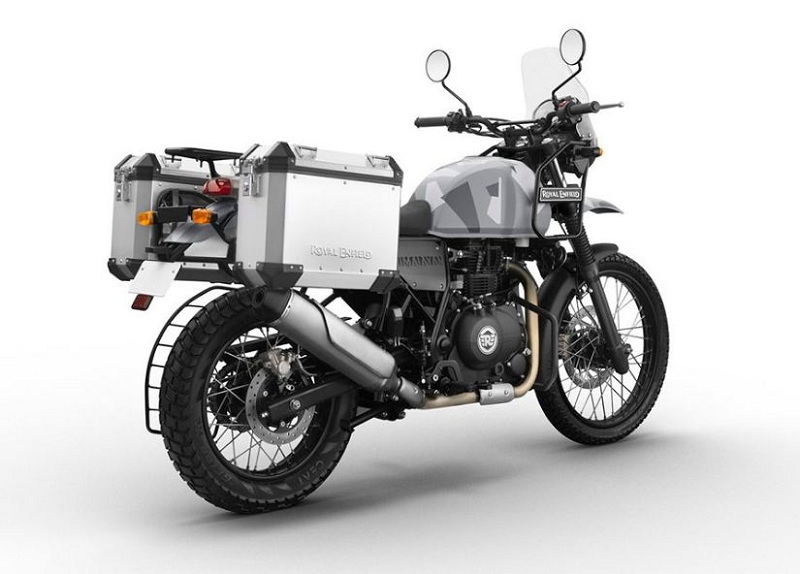 If you are serious about touring, Royal Enfield Himalayan is what you gotta pick.